The longest lasting, most durable sewer system available. Pre-Attached SureLock Fittings-Provide Reliable, Leak-Proof Connections On Each End Of Hose. 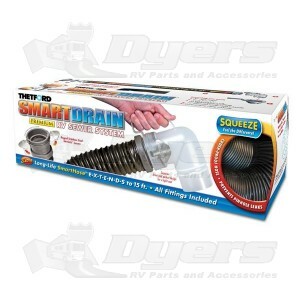 Unique SmartDrain premium sewer system eliminates leaks, connection difficulties, messy storage, and poor fittings. SmartHose is 2.6 times more resistant to leaks from abrasion and 46% more resistant to punctures. SmartHose does not crush, springs right back! Everything you need to do the job smarter! Polymer coil that won't crack, dent of cause rust induced pin-hole leaks. (1) 15’ SmartHose w/ Pre-Attached SureLock Fittings. This is the poorest quality hose i have used in the 40 years that i have been RVing. It leaks at he connection to the waste line due to the poor quality of seal. Everything is cheaply made. This sewer hose kit is the best that I have seen, it is easy to use and very tough. The connections are sturdy and lock together very good, it comes with all the fittings to make a unpleasant job easier. Dyers had fast shipping and a good price on this hose kit.